On its 15th birthday, Google unveiled the “Hummingbird” algorithm which is touted as the most radical change to the Google Search engine over the last 13 years. The last major upgrade to Google Search was the “Caffiene” and this update is likely to effect 90% of Google’s search results throwing the SEO/SEM industry topsy turvy. As users upgrade to more complex search strings, “Hummingbird” searches for a context in every search as against its 15 year old formula of matching keywords. Deep down in the core, the latest changes “hummingbird” is a subtle shift in terms of addressing the web in terms of semantics – the context. For instance – a search query such as “Did FBI plot JFK’s death?” would throw up results based on matching the whole sentence (Priority 1), and then throw searches on “JFK” and on “FBI” – the later results only throwing results on Kennedy and FBI. The Hummingbird however understands the semantics behind the query – and is going to respond in terms of “Did FBI plot JFK’s death?” to “Other conspiracy theories around JFK’s death – to what has been FBI’s stand on JFK’s death through the years. It might throw up a Jacqueline Kennedy Onassis or an Edgar Hoover for instance. All a part of a semantic schema. Or for instance “Pizza in Delhi” would throw up Pizza options but also could throw up options such as newly opened Mexican restaurant serving Burritos or likewise. An earlier execution of the same query would throw up – Pizza, Dominos, Papa Johns, Pizza Hut – all and only Pizzas. The “Hummingbird” would understand the context – a snack or a meal to mine results. Thus, these changes could also drive up the price of Google ads tied to search requests if websites whose rankings are demoted under the new system feel they have to buy the marketing messages to attract traffic. However more importantly, this is a significant shift to a more context aware web – understanding the semantics – and a vertical integration of the search results. I call this Web 3.0 or Semantic Web. Whats your take? 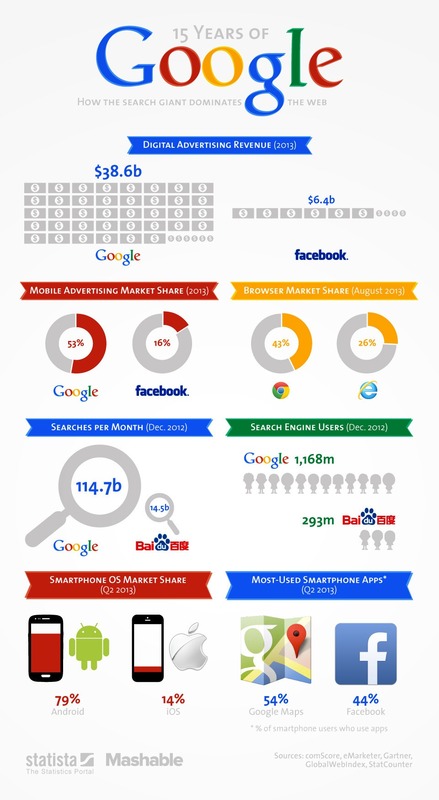 An interesting infographic on Google on its 15th birthday. The $60 billion internet giant possibly will possibly end up having the same impact on history as Industrial revolution 500 years back. 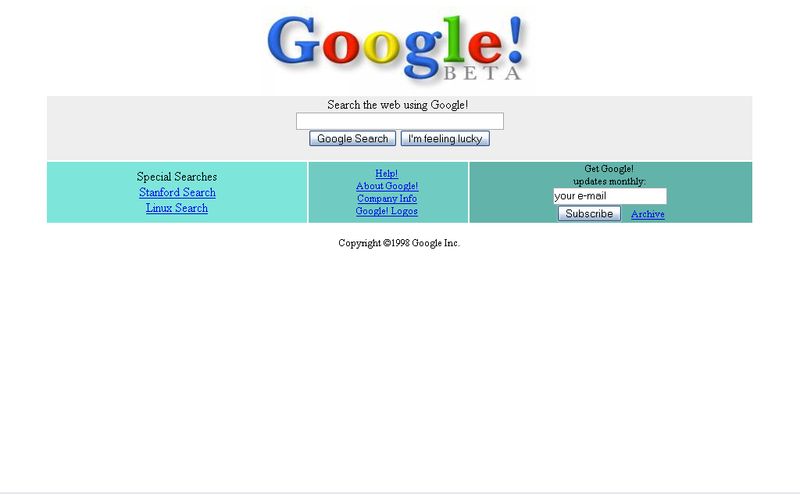 Looking back at 15yrs of Google! As Larry Page & Sergey Brin celebrate Google’s 15th birthday today, even they must be pinching themselves at the thought of just how far their company has come. Google permeates our everyday digital lives in a way many thought unimaginable, even when its humble web indexing algorithm became a verb used in common speech around a decade ago. Before 10am this morning we’d checked Gmail, watched a YouTube clip, accessed a Google Drive document, checked the location of a gig venue on Google Maps, amended our Google Calendar and put some last-minute research into this very article using Google Search all on a tablet running the Google Android OS. Make no mistake, Google as we know it today is arguably the world’s most important and influential company. How, after just 15 years, did it reach such stratospheric heights? When Sergey met Larry It all started back in 1995 when prospective Stanford University PhD student Sergey Brin encountered computer science scholar Larry Page on a campus visit. According to Google’s own website, the pair fondly recall how they disagreed about practically everything they discussed that day. In 1996 the pair began collaborating on Page’s ‘BackRub’ search engine, which by August that year had indexed 75 million URLs and eventually became too big for Stanford’s servers to handle. BackRub became Google (a play on the mathematical term Googol meaning 1 and 100 zeros), the pair garnered some investment, moved into a friend’s garage and, on September 4 1998, the company was officially incorporated in California. The company’s name was inspired by its desire to organise the infinity of the web in a logical way and from an early stage it seemed Sergey and Larry’s secretive algorithms had a leg up on the competition. By the end of 1999 it had gained massive investment from Sequoia Capital, moved to Mountain View, got a dog and hired a chef. A year later it was pulling April fools pranks, launching in 10 new languages and becoming Yahoo’s default search provider. Perhaps more importantly, though, the company began selling ads based around search keywords. It was the fruitfulness of this venture – where competitors floundered – that gave Google the financial clout to expand beyond search. keyboard shortcuts and browser toolbars. In 2003, it acquired Pyra Labs, the creators of Blogger. 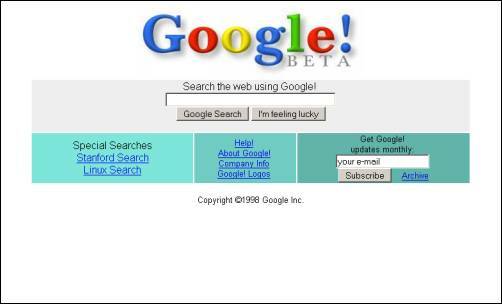 In 2004, it launched Gmail, powered by Google Search and bought Keyhole, which would eventually become Google Earth. A year later it launched Google Maps, soon adding satellite imagery and step-by-step directions, as well as Gtalk and the now dearly departed RSS reader Google Reader. Calendar, Picasa and Documents (following the acquisition of web-based word processing firm Writely) arrived in 2006, Street View arrived to complement Google Maps in 2007 and the Chrome web browser made its debut in 2008. A hugely significant landmark was its heavily-hyped stock market floatation in 2004, by which time the company had commandeered 85 per cent of all web searches. With its IPO Google secured a value of $27 billion, making Larry and Sergey very rich men indeed. Believe it or not, some thought the company had been overvalued based on Yahoo and Microsoft’s ongoing efforts to build rival search engines. With the cash flowing in from Wall Street in 2006, Google moved for its largest acquisition to date by snapping up the YouTube video-sharing site for $1.65 billion in stock and began selling ads on videos. 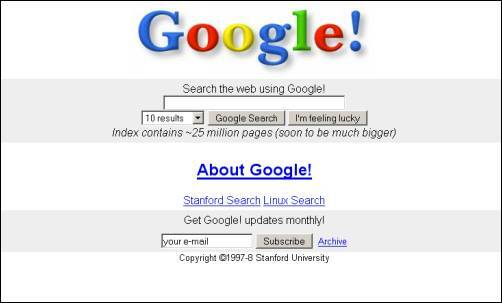 Since then, Google has continued to cherry pick companies and start-ups with fervent regularity. Over the last year it averaged one acquisition a week, with notable examples including Motorola’s mobile unit ($12.5 billion), smartwatch manufacturer WIMM and community sourced navigation application Waze for the small matter of $1.3 billion. Getting all its ducks in a row on the web allowed Google to line-up an assault on the mobile world with the Android operating system, which has undoubtedly proved to be the company’s biggest success outside of search. Set up in 2003 by Andy Rubin and co, Android was acquired by Google in 2005 and pitched as an open source operating system for a new breed of smartphone devices. It’d be another three years before the first devices would emerge, setting the industry on a path to the Android / iOS duopoly as Symbian, Windows Phone and BlackBerry fell by the wayside. The arrival of Android and its subsequent success through eager manufacturers like HTC, Motorola, Samsung and LG may have ruined Google’s cosy relationship with Apple – Steve Jobs threatened to go “thermonuclear” on Android and accusing Google of “wholesale ripping off” iOS – but by this point it didn’t matter. Google had made itself indispensable to iPhone users, while regular dessert-themed software updates (you’ll see statues of each strewn across the front lawn at Mountain View) continued to push Android towards fulfilling its potential. Custom skins from its manufacturing partners also provided innovative new twists and nuances. During the early days of the Android era, Google launched its first piece of branded hardware, the Nexus One made by HTC. The buggy device proved a bit of a disaster with Google selling through its own fledgling store, rather than through networks, meaning limited customer support for buyers. Google learned a valuable lesson and devices like the Nexus 4 smartphone and Nexus 7 tablets have proved huge hits. Globally, it currently boasts around 80 per cent of the market and its increasing tablet share has allowed Google to push itself as an all-things-to-all-people entertainment content company too. There are even dedicated games consoles like Ouya and the Nvidia Shield running Android, while smartwatches, televisions and cameras boasting Google’s software are becoming more and more prominent. Next up? Google Glass. However, it’s not like everything Google touches turns to gold. For every success the company has enjoyed down the years, there’s been a failure. As much as Mountain View endeavours to make the Google+ social network the centre of its ecosystem, users just aren’t biting. Its previous social experiments, Buzz and Wave were not well received. It also bought mobile social network Dodgeball in 2005, before the founder Dennis Crowley got frustrated with Google and left to start Foursquare. Jaiku, a microblogging platform Google purchased in 2007, went the way of the dodo, while Google Latitude, a Google Maps tool that broadcasts the users location, was met with trepidation. The iGoogle personalised homepage, which has been re-imagined on Android as Google Now, was another casualty on the web. More recently, the cloud-based Chrome operating system, which features a suite of web apps and appears on Chromebook devices with little or no local storage,hasn’t been around quite long enough to be deemed a failure, but it can’t be deemed a success either. Google TV, the company’s effort to bring its search expertise to the TV world,allowing live television and on-demand video platforms to be seamlessly integrated and joined by high-powered Android apps and games seemed like a good idea in principal. It somehow snatched failure from the jaws of success and now the tech world is simply waiting for Apple to jump on board. Google’s company motto ‘Don’t Be Evil’ is a commitment to doing right by the world with the idea that it’ll prove beneficial from a business standpoint in the long run. It’s a noble and rare ethos for a company with a market cap of around $300 billion, and although the world is probably a better place thanks to Google, the motto has left the company open to criticism when it is deemed to fall short. Rivals and competition regulators in the EU and US have accused Google of manipulating its search results to ensure its own products, such as Google Play apps, are ranked higher than more popular iPhone apps. And Google has been in trouble in multiple countries, including the UK, for harvesting data from public Wi-Fi networks while driving around in its Street View cars. This was dismissed by Google as a simple mistake. Then there was a consolidation of 60 privacy policies from its various products (YouTube, Gmail, Chrome etc) into a single document in 2012 which didn’t give users the opportunity to opt out. Google is also good at putting people in their place over their data. In August this year the company said its 425m Gmail users should have “no reasonable expectation” of privacy. Then in same month, the company claimed UK privacy laws have “no jurisdiction” over the company, amid allegations it by-passed do-not-track software within Apple’s Safari browser in order to provide personalised ads for users. And then there’s the small matter of tax. The incredibly small matter of tax. Yahoo! Axis. Impressive! Hope they dont mess it this time. In the course of the last decade Yahoo! has lost out on every major initiative whether be Yahoo profiles and chat (To Facebook) or Search (to Bing) or Flickr (To Instagram). Once the most important Internet company, Yahoo! has been reduced to a state of profitable (shrinking fast) irrelevance. There was no major stake on how Yahoo! could influence Internet browsing behavior or leverage search or take a stake in the mobile bandwagon. Therefore Yahoo! Axis a refreshing new initiative from an almost dinosaur internet company. Axis essentially is a browser for iOS devices and a browser plugin for desktop computers. It has a premise and the intent is in the right direction. Interestingly now, Axis will help Yahoo! skip trying to compete with the dominant desktop browsers and instead offer a plug-in that works on all of them. That enables Axis users to extend their browsing habits to the Axis apps for iPad and iPhone, which is much less settled territory. Mobile and tablet browsing is the next frontier, and Yahoo is wise to focus the next stage of its business there. It essentially seeks to integrate the browsing and search experience. Users will not be required to launch a new page. Both the experiences are well knit on a single page with the usual bells and whistles. Why waste time on the search engine when the search process is built into the browser. Axis does away with the blue links that have defined internet query results for a decade and replaced them with previews of pages that might provide the information being sought. Understandably the experience is touch led – which is a key to the mobility, smartphone and tablet platform. Finally then, Yahoo! has some ground on hand held devices with the Axis app. Also key is the seamlessness of the experience which can be shared across all iOS devices. It would be interesting to see how Yahoo! recreates the iOS type experience across a range of disparate platforms each not exactly talking to the other. Possibly the plug-in would do the trick… but experience is the key here. On the flip however, Axis is somewhat of a double edged sword because it by-passes the search results page. Yahoo still makes a quarter of its revenues from the sponsored links on this page. However, Yahoo! is betting its future on the convenience and speed of this search concept. The seamlessness of the experience is the consumer hook. What keeps them there is the way Axis syncs browsing history between the desktop and mobile versions, so users can switch back and forth easily between devices. Once there is enough data on the users, Yahoo can sell you all its services by promoting them heavily in the app and its search results. Of late Yahoo! has lurched from one crisis to another. It still makes money but the future is very uncertain given the mobile dominance building on the internet, advent of Facebook and Google. Axis is thus a step in the right direction. Yahoo! still wants to take one more fight.. In 5 years, Yahoo! had 4 CEOs leading it starting from Terry Semel, Jerry Yang, Carol Bartz and Scott Thompson (the latest recruit). The appointment raised questions among analysts, since Mr Thompson, 54, has no experience in online content and advertising, Yahoo’s chief sources of revenue. The timing of Mr Thompson’s hiring also came as a surprise, given that Yahoo’s board has been considering a sale of all or part of the company since firing Ms Bartz four months ago. Yahoo’s stock hasn’t traded above US$20 in more than three years. Microsoft Corp offered to buy Yahoo in its entirety for US$33 per share, or US$47.5 billion, in May 2008. Yahoo trades at $15.58 now which is less than half of what Microsoft wanted to buy it for.Analysts estimate Yahoo’s revenue last year totalled about US$5 billion, down from nearly US$7 billion in 2007. During the same span, Google’s revenue soared from US$17 billion to an estimated US$38 billion. Thanks largely to cost-cutting measures imposed by Ms Bartz, Yahoo has become more profitable. Last year, it earned an estimated US$1.1 billion, up from US$660 million in 2007. Still, investors are disappointed with the downturn in revenue at a time when advertisers are spending more money on the Internet. Yahoo! is a waning off fast and thick and it now is Mr Thompson’s gamble to bring back some respectability to the beleaguered Internet giant. It will take a miracle to revive Yahoo. For long,Yahoo! has rested on its banner ads and scale based business models to make money and has skipped taking stakes in two generations of Internet based services: Mobility and Social Web. The question that Yahoo! needs to answer itself is “What is their business competency and how do they intend to deliver value to their consumers?”. Even now Yahoo! bets on its scale to do something around a very mediocore competency area- online advertising,media and content. There are many others in the same business and there is nothing really differentiated that Yahoo! currently seems to be planning to take it to its future. 1. What is Yahoo!’s future business? Yahoo! will need to really search deep into the future to figure out which businesses would make sense to it and what competencies could be brought to the fore. 2. Yahoo! must exit its long tail services as soon as it can- This will increase focus on what it really could do with any difference and possibly provide capital for a larger scope in online business. 3. Yahoo! must stop being quintessential US and regionalize fast- Yahoo! could look at taking the pole position in emerging economies such as India, Indonesia, China, South Africa with a regional focus. The next big growth curve is past Europe and America and if Yahoo is able to capitalize its internet lead in these nations, there might still be a story waiting to happen. 4. Is there a story in enterprise search or vertical searches on small screen computing devices? There may be a choice out there. Is there a case for search engine for Apps? 6. Is there a case for Yahoo! becoming world’s largest content aggregator? It sure has the bits and pieces. Yahoo! will need to think about stitching all the disparate pieces together in quick time. This may not yet be the magic portion, but Yahoo! needs to look at discontinuity in its product lines, in its DNA and its thinking to get ahead.